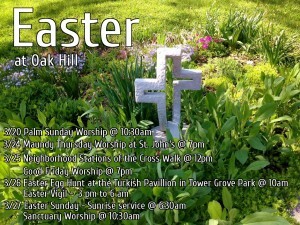 We invite you to join us in experiencing Holy Week here at Oak Hill. During Holy Week, we go through it all- from waiving the palms, washing the feet, walking with the cross, facing death, sitting in grief, and then rising with dawn and celebrating new life! Care has been taken to offer opportunities for all to share in that journey, but we understand that work, family, and other commitments sometimes keep us from coming to church 5 times in one week. So, we’ve also created an at-home devotional. With this little guide, even if you can’t make it to these gatherings, you can join us, and Christ, on the Passion journey. Be sure to come early (9-10am) to share a special pancake breakfast to benefit our summer Youth Mission Trip before joining in worship with palms at 10:30am. On March 24, we’ll share worship with our neighborhood congregations, hosted at St. John’s Tower Grove Episcopal Church, located at 3664 Arsenal Street, at 7:00 p.m. This service will include communion and foot washing. 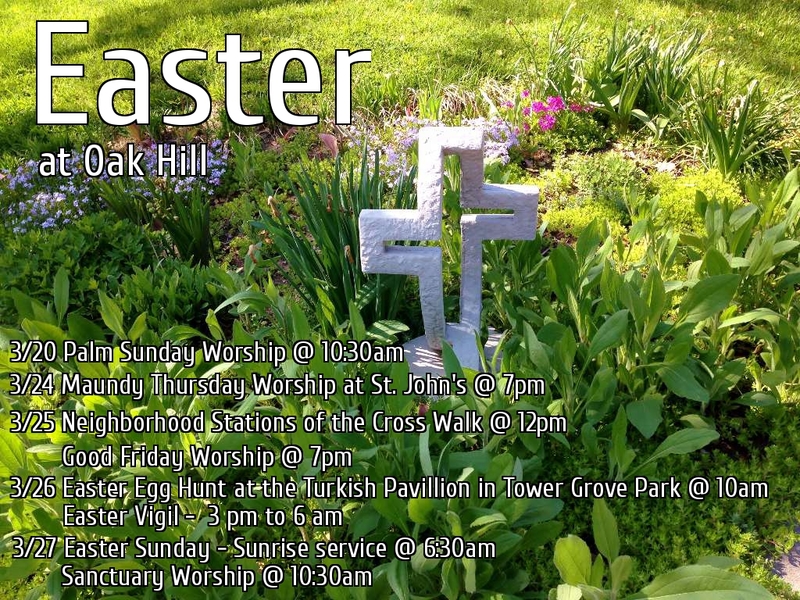 Friday, March 25, at 12 noon, there will be an ecumenical Stations of the Cross walk, beginning and ending at St. Louis Mennonite Fellowship at 3752 Giles Ave. Then, that evening, Oak Hill will hold a Good Friday worship service in our sanctuary beginning at 7:00 p.m.
Oak Hill’s annual Easter Egg Hunt will be Saturday, March 26, at the Turkish Pavilion in Tower Grove Park starting at 10 a.m. Children are asked to bring their own baskets. From Arsenal Street entrance (Center Cross), the Turkish Pavilion (with a red and white roof) is on the right (before you reach the Shakespeare Statue and Flag Circle). We’ll hold our annual Easter Vigil, beginning at 3:00 p.m. on Saturday and ending at 5:00 a.m. Easter morning. Our goal is to have one person each hour hold vigil in the sanctuary as we wait for the resurrection of Jesus. Participants can take the time to pray and meditate for an hour. A sign -up sheet will be available in the Large Assembly Room during coffee hour during March or until all slots are filled. See Kim McMullin or Pastor Erin if you have any questions about Easter Vigil. On Easter Sunday, we will have two worship opportunities, the first being at 6:30 a.m., at our Sunrise service. This will be held outdoors on the church’s front steps, so dress warmly. Communion will be served. Then, our normal Easter Sunday worship service will be held at 10:30 a.m in the sanctuary. Communion will be served. Don’t forget to bring some flowers from your garden to help us flower the Easter cross. Note: There will not be any Sunday School classes on Easter. We’ll celebrate Holy Humor Sunday on the Second Sunday of Easter, April 3rd. With silliness and song, and then a hilarious pot luck lunch, we will continue the celebration of joy in this Easter season.